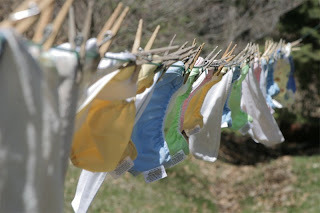 Some of my bumGenius diapers sunning on the line. 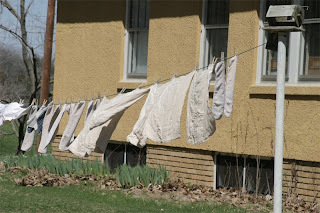 This is the first day that's been both warm enough and sunny enough to reap the benefits of line drying the diapers. Bye-bye stains! Some my prefolds and inserts. And the back of my house. 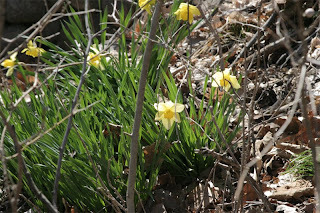 The daffodils are up both near the spring cistern and the porch. 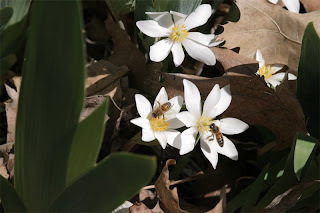 I've been following the plight of the western honey bee with regards to colony collapse disorder. Even though you might think, "so what, the bees are disappearing," it's a big deal - they are responsible for pollinating 30% of the crops we grow here in the US, including peaches, applies, soybeans, and a variety of berries. The problem is spreading to other regions of the world. I'm reassured to see honeybees buzzing around.